Once you’ve experienced some of the typical touristy things in Sydney, you need to stretch your imagination further and just get out there and explore the city. On our recent second trip to Sydney, I still had a few more main sites to cross off my list in the CBD area. However, I mainly wanted to focus on exploring some outer areas such as Parramatta and Manly Beach, where we rented this cozy Airbnb apartment just a block from the water. There’s so much to see and do in Sydney that I think you could enjoy something different every time you visit! See for yourself! One day I was walking quickly to Circular Quay to catch my ferry boat when I passed the retro-looking Parlour Lane Roasters. I made a mental note to return the next day. This coffee shop – a Euro-style café by day and apertivo wine bar at night – is located next door to the ornate State Theatre. The Art-Deco theatre, opened in 1929, looks like another interesting place to visit. However, I only had time to sip my flat-white while people watching and soaking up the atmosphere around me. As you walk through the CBD and the Rocks, you can’t help but notice the historic, 19th-century buildings made from local sandstone amidst the modern-day high rises and skyscrapers. Since I love to wander with my Canon camera, I can’t help but stop here and there and photograph these buildings. Many of these date to the 1850s due to the city’s wealth and population increase following the gold rush era and an increase in Italian immigrants in the 1860s, which led to more ornamentation, arcades and square towers. Just look around! Another Victorian-era beauty (dedicated to Queen Victoria II) is the QVB, designed by a Scottish architect in 1893. This building’s dominant feature is its central, copper-sheathed dome which has a stained glass window view from the interior. Here you’ll mainly find upmarket boutique and brand-name shops, but the two tea rooms and the Old Vienna Coffee House looked the most fascinating to me. Built around the same time as the QVB, the Strand Arcade is another beautiful, historic shopping center located in Sydney’s CBD. When the Strand opened in 1892, it was described as the “finest public thoroughfare in the Australian colonies.” Definitely pop in here simply to admire the architecture or shop at one of the more normal-priced stores here. Just east of the CBD is Australia’s oldest public park, Hyde Park, which was named after the same park in London in 1810. This 40-acre park is known for its magnificent fig-tree lined paths and open space. Include a stroll through the park on your Sydney to-do list. At the southern end of the Hyde Park is the Anzac War Memorial, built in 1934 to honor the Australian soldiers who fought in World War I. The marble-lined interior features a domed ceiling adorned with 120,000 gold stars, one for each of the WWI military volunteers. Take a few minutes to stop in here and reflect on all those who have fought and died for our freedom. I’ve often enjoyed doing free walking tours when we’ve travelled. I usually find they are a great way to explore a new city as well as learn about its local color. Unfortunately, I simply ran out of time on this trip. If interested, there’s three I’m Free Walking Tours offered daily. My husband works an awful lot so his weekend treat was to take a surfing lesson. 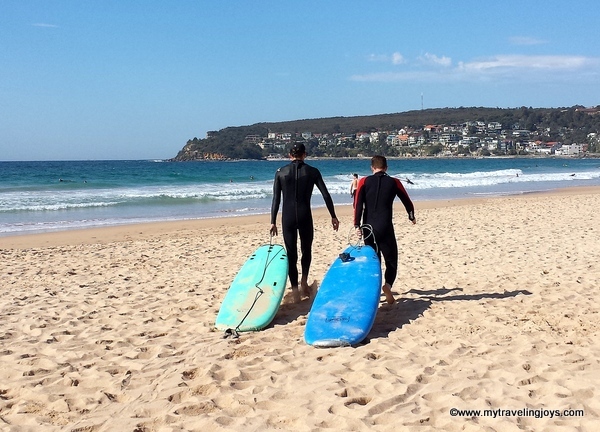 We hired a private one-on-one instructor from the well-known Manly Surf School. At 100aud ($70usd) for an hour, the private class seemed reasonable. After several failed attempts, hubby successfully stood up on his board twice during the class. He says, surfing is much tougher than it looks! After seeing a photo on Instagram, I was determined to find this mysterious “wormhole,” with directions given as “follow the rocky path behind the Queenscliff natural pool.” Well, technically these directions are correct, but you definitely need to clamber over some rocks to find this tunnel. And the path isn’t really a path at all. The “Wormhole” is a man-made tunnel created by locals in 1908 to link Manly and Freshwater beaches. What you’ll find is a dark archway carved into the rock face and a tunnel that has been weathered smooth in places by wind, rain and sea water. We explored the wormhole and nearby cliffs for a bit, but didn’t venture out to Freshwater beach. The old pathway still remains, but some has been covered up by rock falls. From Manly Beach, we walked past Shelly Beach and then up through bushland paths and then eventually past the old North Fort and to Fairfax Lookout, which is the tip of the North Head Sanctuary. From Fairfax Lookout, you can enjoy panoramic views of the bustling Sydney Harbour and the city’s skyline. Since it was such a warm day, we spotted a nearby beach on the map and decided to head that way. Collins Beach, a small patch of sand just 10 minutes from Manly Pier, seemed to be quite popular with the 20-something crowd the day we visited. Lots of beer cans were scattered here and there, so we didn’t feel so bad sipping wine from the plastic cups in our backpack. We felt like we had definitely stumbled upon a local’s secret. Parramatta Park is home to the UNESCO listed Old Government House, established in 1799, making it Australia’s oldest public building. The “mansion” served as the country residence of the 10 early governors of New South Wales, and its interiors are preserved in the 1820s fashion. I skipped the 16aud admission ticket simply because I wasn’t that interested in British Colonial history. Instead, I wandered around the park and sat down by the riverbank to eat my take-away lunch. The suburb town of Parramatta itself is filled with historic buildings and many cafés near the Town Hall. A farmer’s market is held in the square every Friday, which is where I bought my delicious lunch. River views along the Parramatta. From Circular Quay, the river cruise to Parramatta takes 90 minutes. I’d only recommend visiting if you have a lot of time and/or are interested in Colonial history. To save time, I took a 40-minute train ride back to Town Hall station in the CBD. Since my husband often works in Sydney now, I imagine this won’t be my last trip here. Do you have any sightseeing or restaurant recommendations for my next trip? you sure lead an interesting life! how is it being somewhere that you don't have to learn a new language? Great post, Joy, and great images! I'll be in NSW from January to end of March, so we'll be able to try these out whenever we are in Sydney. I'm not sure where you are based, as you seem to be all over the place, but we might even be able to catch up. Thx Joyce! Well being able to speak English has made every day tasks much easier, but we're finding it difficult to make friends. When you speak English in a foreign country, we found it formed a bond more easily with others. 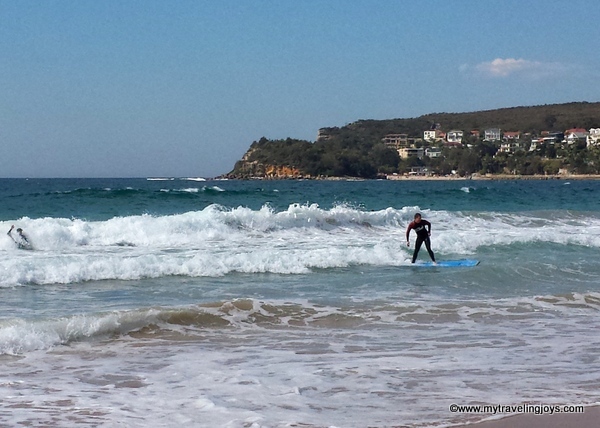 In Sydney, there is a never-ending stream of activities to get busy with when you can find the time! Even for locals, there's always something to try for the first time or to revisit! Sometimes we just have to go out there and do things out of the norm to really have a fruitful adventure! Here at Adelaide, the same situation applies. Visitors simply visit the same old attractions that everyone visits so their time here is rather mundane. They should instead explore alternative hangout places that are still interesting though not popular.